I’m not writing a review about Crypts & Things because I was one of its playtesters. So, instead of an Augury post, I’m gonna write a – completely partial – analysis of this awesome game. Oh, and even if I wasn’t a playtester I would do it. Because it’s indeed awesome! You were properly warned. This quasi-review was based on the hardcover edition. Crypts & Things is a 146-pages, B&W book. 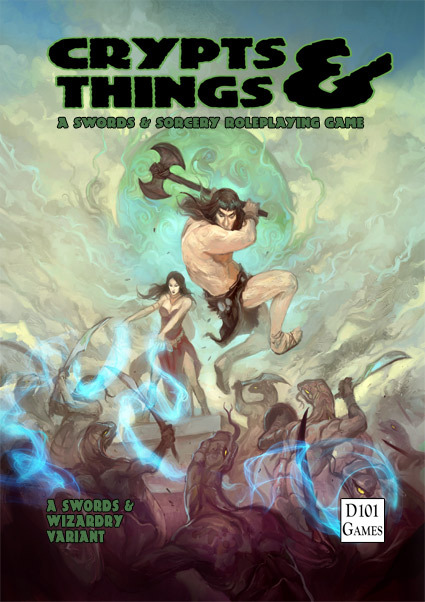 Crypts & Things is a retroclone that manages to marry two great things – the Sword & Sorcery genre and the Swords & Wizardry rules. In other words – this a D&D White Box-derived RPG built to emulate the best elements of the Sword & Sorcery genre, like the fictions from Howard and Leiber; and no, this isn’t just another retroclone claiming to “restore” the S&S roots of D&D. This time it is for real. Want examples? No Cleric class, no Alignments, Black/Grey/White Magic division, Human as the only (playable) race… must I keep going? Crypts & Things was written by Newt Newport of OpenQuest fame. The game is based on the famous S&S hack, created by Akrasia, from Akratic Wizardry. In fact, you can find Crypts & Things’ main inspiration on material from that great blog. Like Swords & Wizardry, Crypts & Things is a very light and open-ended rules system, excellent for groups that want to get right into the action and for Referees that love abstract (but intuitive) rules and ad hoc rulings. Crypts & Things uses the same old Ability Scores, but with a more generous bonus progression (modifiers usually go from -1 to +3). Intelligence 15+ grants you an extra spell, while Wisdom is now linked to a PC’s Sanity (more on this later). Charisma determines the maximum number of hirelings, besides indicating the PC’s base % on Charm attempts. The game has 4 classes: Barbarian, Fighter, Magician and Thief. The Barbarian is purely Conan-esque – you’re good at survival and have a good sense of self-preservation; you prefer to fell your enemies quickly (the first strike ability) and fly in berserk rage instead of running away when subjected to Fear effects. As I said – you’re Conan. The Fighter is a combat master – you have access to all weapons/armors, has better HPs (great design choice), multiple attacks and specialist combat styles (another excellent rule from Akratic Wizardry). The Magician is the one place where Crypts & Things truly shines (and also where the game clearly states that it is pure Sword & Sorcery). Magic here is divided in Black (necromantic and damage-dealing stuff), Grey (divination and more traditional spells) and White (healing and protection) – all types of spellcasting deal exhaustion to the spellcaster (loss of HPs). Black magic is the hardest – it not only drains more HPs, but it also can corrupt the Magician by driving him mad. It’s simple. It’s perfect. You can cover a lot of quintessential concepts with this base class, from the dark Stygian priest to the mysterious but friendly eastern mystic. Crypts & Things’ Thief is more of a rogue, clearly inspired in the Grey Mouser, not in Bilbo. You get a better AC by using light or no armor, you’re good with languages, two-weapon fighting, perception, stealth, among other basic thievery. While Crypts & Things does use a Skill system (more on it), it keeps its Old School roots by giving basic advice about the “whens” and “hows” of rolling Skill checks. The game doesn’t exclude other classes from attempting “roguish stuff” – the Thief just do that better. After choosing your class it’s time to roll your Life Events – a small but very cool table with the most important events and facts about your early life. “Nice” things like being an ex-slave, a conscript from some tyrant army, an ex-apprentice of a dark sorcerer, a survivor from some twisted game/dungeon/ruins etc. Each event gives you not only background ideas, but also small mechanical benefits. Equipment is standard for Sword & Wizardry. Weapon damage uses different dice (instead of only d6s). AC can be either ascending or descending. Crypts & Things uses Saving Throws as a general task resolution system, another idea originated from Akratic Wizardry’s house rules. This fact is already computed on the character classes, specially the Barbarian and the Rogue. Sanity in Crypts & Things works similarly to Call of Cthulhu and various other games, by using a pool of Sanity “Points”. This is your Wisdom Ability Score. When witnessing “unspeakable horrors”, the heroes must succeed at a Saving Throw or lose Wisdom. Most of the time this loss is temporary (Black Magic also provokes insanity). Combat is also Sword & Wizardry standard, except for two things. First, everyone in Crypts & Things can backstab! This is another example of how a small rules’ change can greatly impact a game’s flavor. The second: hit points. Heroes begin the game with maximum HPs and they represent only ‘superficial’ damage. When drained of all HPs, a hero start losing Constitution, which here represents serious wounds. HPs are recovered quickly, while Constitution takes more time. Crypts & Things has a few advices on magical research and complete rules for hirelings and assistants (although I do miss a ‘lite’ mass combat system). The ancient gods abandoned mankind, and in their stead stand a variety of parasitic deities who only answer prayers when given blood sacrifice. Most Priests are charlatans and the gods they worship a hollow lie. A dark few worship the Greater Others, spilling vast quantities of sacrificial blood to their masters in return for temporal power and an eternity of damnation. The priests of Mount Terror are such a group, but the cults of the terrible Greater Others are spreading like a disease through the decadent decaying cities. This is why we practice the arts of Sorcery, sacred mathematics, holy gnosis that transcends the lies of the priest. Crypts & Things’ setting is described in a very open-ended way, which each region or major city getting a short description, besides an entire map on the continent of Terror. The following section is dedicated to treasure and magic items. Crypts & Things’ magic items are usually cursed or providers of dubious blessings – very in touch with S&S literature. It also pleases me that “mechanical balance” is not a factor in the creation of these objects. Finally, we get a full bestiary, filled with otherworldly demons, ghouls, dinosaurs, fishmen, giant apes, serpent men; besides classic fantasy stuff like dragons, golems, elementals (and pluck puddings). There’s also advice on creating monsters and encounters. Crypts & Things’ has a small dungeon for 1st level PCs, “Halls of Nizar-Thun”. The adventure is very basic, a typical introductory dungeon crawl (albeit one with a nice twist in the form of a cursed magic item). Crypts & Things’ ends with 14 short Appendixes. There’s a lot of useful stuff here – guidance to running S&S games, random objects, city events, Love Loss (one of my favorites), Khaos! (mutations! ), bibliography (guess which Appendix is this? ), soundtrack etc. The book comes with a character sheet. Crypts & Things isn’t revolutionary or pioneering, but it does manage to do something that many retro-clones and even official d20 games claim to do (but don’t) – it does Sword & Sorcery, using a light rules system, brilliantly. I don’t know why it’s always under the radar on the blogosphere and forums. This is really a cool game, which deserves more attention. OK, here’re a few abilities (2 feats and a rogue talent) that I came up after running D&D Next Playtest for my players. These were aspects of the (potential) new edition that I particularly enjoyed and that I guess can also be easily inserted in Pathfinder. You execute your attacks with extra force and brutality. Even if your enemies avoid your main strike, they suffer minor cuts and bruises. Benefit: You can, once per round as an immediate action, after failing a melee attack, deal your Strength modifier in damage against that target. If you choose to use this benefit, you suffer a –2 penalty to your AC until the beginning of your next turn. You are not only an erudite, but also know many sources of mundane and eldritch knowledge. Benefit: If you fail a Knowledge check, you know at least one place where to get the information sought. This can be a person, an item or place (chosen by the Gamemaster). You failure seem certain, you can fall back to your experience, instinct or just blind luck. Benefit: You can, once per day, after rolling any Skill check, but before knowing if it succeeded or failed, treat the result as if you had rolled a '11' on the d20. 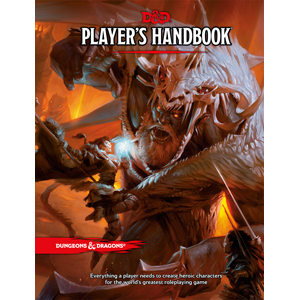 I mentioned before that Nyambe is to me the perfect example of what every D&D/Pathfinder supplement should be and I must stress it again here – yeah, it’s that good (even considering it that it was written for the 3.0 rules). Grab a copy if you can. 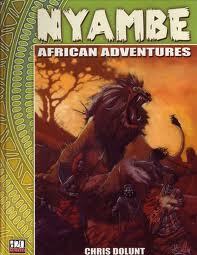 Nyambe – African Adventures is a 255 pages hardcover from Atlas Games for D&D 3rd (pre-3.5). It’s a B&W book, with good illustrations, although I do wished the author had provided more “tutorial” pictures – things like typical houses, cities, common items etc. (although it’s relatively easy to track the equivalent African cultural through Google/Wikipedia and thus to find some good visual examples). The first chapter details the history of the continent-setting of Nyambe. It’s a short chapter (only 6 pages) that instead of filling us with bizarre named fallen empires and NPCs, gives us a simple and engaging history, aimed directly at common D&D themes and elements. For example, there’s a justification for the divine/arcane magic separation – the latter is the result of “black magic” because it steals power from the Overpower (Nyambe’s Creator deity); there’s also a cool myth regarding the secret of resurrection and how it was lost (a hint for adventures); and the origins of the – now extinct – orc race and how their evil empire once ruled over all Nyambe (an excellent reskinning of the orcs before they degenerated to the common brute humanoid loved by us all). Again, the author’s interest here is foremost in making Nyambe a useful D&D sourcebook and not in teaching true African mythology and religion. The next chapter describes the Nyambe races. They’re divided in human, demihuman and savage races. The human “races” are actually twelve different cultures, some clearly derived from true African civilizations, while others are original creations, like the witch-hunting Zamara who’re influenced by contact with Far Eastern cultures. This is another really awesome aspect of Nyambe – its toolkit approach. The author gives reference to previous contacts between Nyambe and “Northerners” (European-like people), “Near Easterners” (Middle-east stuff) and “Far Easterners” (Asian) cultures; and there’re also the so called Water People (that’s the Egyptians). However, these foreigner civilizations are left open to be used (or ignored) by the Gamemaster. Nyambe thus just cries to be integrated in another setting. The demihuman races are the African-equivalents of the common D&D races. Instead of halflings, you have a fierce race of burrowing “weasel-men”. The somber and shadow-aligned kitunusi replace the cheerfully gnomes; while the Nyambe dwarves are the obsidian-skinned and cannibal utuchekulu. A sinister legacy from mythical Kosan (orc) Empire, the savage and proud ngoloko are a half-orc race that breed true; while the unthlatu are a race descended from the half-dragon sorcerers responsible for the orcs’ demise (and ironically now the target of prejudice from the other races). Instead of elves, we get the wakyambi, a peaceful and graceful race of brown-skinned and white-haired tree-dwellers. Many of these names (and a few traits) are derived from African legends, adapted to D&D. Instead of Fighters, we get the Gamba, resilient village warriors (d12) adapted to fight without armor through Sanguar (the art of dodging). Since arcane magic is seen as something forbidden, there’re no Wizards in Nyambe, only Mchawi – necromancers that steal power from God and if killed can reincarnate in the form of vile animals. Rogues are replaced by the Nanala – stealthy stalkers and ambushers (a more common role for these characters as locks and traps are rare on Nyambe). In Nyambe sorcery is exclusively the province of dragons, so the Sei Sorcerers are mortal born with draconic blood. Each sorcerer must choose a specific a particular dragon bloodline (in Pathfinder the idea of “sorcerer bloodlines” are the official rule, but remember that Nyambe was released in 2002). The Dembe are monster hunters that replace the Ranger class (besides Favored Enemy, they gain Favored Terrain, which at the time was still a fresh idea). The Engolo are unarmed martial artists, who’re trained to fight with musical accompaniment (a style called Sandai and which reminds me of Capoeira). Inyanga Yensimbi are the masters of the element iron, considered sacred in Nyambe. This is my favorite prestige class, which a nice mix of mechanics blended with excellent flavor – these guys are mystical blacksmith-warriors. The Leopard Cultist started as a protectionist organization opposed to trade with foreigners, but the society was later tainted with lycanthropy. Another original prestige class, aimed for NPCs. Magic eaters are the quintessential which-hunters created by the Zamara culture. Mask Makers are magical crafters and members of Nyambe male secret societies. Mganga are witch doctors, arcane/divine spellcasters trained to fight black magic. The Ngoma (or “drummers”) are a great reskinning of the Bard class, adapted to African settings. The Nibomay Amazon are fierce female warriors, famous for their tactical prowess. The Soroka is another unique prestige class. The “poison oracles” that divine the future by analyzing the death-throes of poisoned animals. Zombi Cultist are servants of the orisha of undead and serpents (a very pleasant fellow). Chapter Six is about skills, feats and combats. Because Nyambe was released for D&D 3.0, we get new skills, an aspect that practically vanished with the 3.5 Revision. Among the new skills are Natural Medicine, practiced by the omugaanga (medicine men). It’s sort of “natural” alchemy, with rules for getting components directly from the wilds or from monster parts. The Scry skill (remember that?) can be used in Nyambe for omens. Among the feats, many are ex-class abilities (like Evasion and Improved Evasion), changed to feats to represent the fact that they aren’t found among Nyambe’s core classes. Many feats are racial (like the breath-weapon and energy resistance of the unthlatu), while others represent local traditions (like Culinary Ashe, that let you create “magic food”). After the feats we get rules guidelines for Nyambe’s war traditions – brush fires, ritual warfare, cattle raids, nuba matches and engolo duels. The next chapter is about equipment and trade goods, listing also new armors and weapons. The most interesting innovation here is that any weapon not listed in this chapter is considered a “foreign weapon” and requires a special feat to be used without penalty by Nyambe natives. The adventuring items help to develop the exotic flavor of the setting, with new mounts like the engargiya, new drinks like banana beer, besides new superiors items (healing salve) and poisons (in Nyambe the use of poison is not considered an evil act). Chapter eight details the orishas (spirits) of Nyambe, appeased by the various N’anga clerical traditions. We get a list of celestial and fiendish orishas, besides rules for ancestor, elemental and natural spirits. The next chapter details new domains, spells and special rules for the mojuba bags (the closest thing to a grimoire in Nyambe), summoning spells and resurrection magic. Finally, Chapter Ten is about “Lands, Nations and Societies”. This is another place where, in my opinion, Nyambe shines. First, we get a geographic overview of the continent, its islands, oceans, mountains, forests etc. – each one briefly described followed by a table of Random Encounters. Definitely practical (and totally Old School in approach). After that we get short descriptions of the land’s seven nations and major chiefdoms. Again, all descriptions are short, direct, but flavorful, providing a few campaign/adventuring hooks. The details aren’t exclusively to human and demihuman realms, as there’re also a few monster realms (yuan-ti and sahuagin for example). At the end, the book provides information on typical secret societies. Chapter Eleven is about adventuring and is aimed at GMs. There’re extensive rules for diseases and secrets regarding the nations described at the previous chapter. I must point out that Nyambe doesn’t have a metaplot – instead of true “setting revelations” we get suggestions about what can be going on around the continent. The chapter also updates treasure tables for African-like campaigns. The next part is about magic items. Although we have new items, my favorite bit about this chapter is about the new or improved magic items – things like potions that contain high-level spells, advanced rings, magic rod that can be made into intelligent items by using magic rings and the gris-gris (magic bags used by spellcasters the replace scrolls). There’re also new weapons, armors, lots of magic masks, reskinned items from the Dungeon Master Guide, cursed items, artifacts (minor and major) and even a few trinkets (lesser magic items aimed at non-adventurers). The last chapter is about monsters – lots of them. Readers of Dragon Magazine (specifically Charles R. Saunders’ article on Issue #122) will recognize various creatures. I particularly enjoyed that the author drew from many of the same myths briefly quoted by Saunders. But before delving into this African bestiary, we get excellent advice on how reskinning and adapting creatures from the Monster Manual (like the cockatrice, which here is a crowing crested serpent-like creature). Among the new critters there’re various animals, lycanthropes and wereanimals. The book detail new demons, devils, half-orc monsters and famous African legends, like the unicorn-like chepekwe, the boat-crushing dingonek, the kongamato, the bizarre mangabangabana, the alien nommo, the true zombie and the vampire-like terkow (both templates). There’re also “D&Disms”, like ancestors of the yuan-ti (the samat) and the arcane kosan orcs. As mentioned previously, Nyambe is a hell of a D&D supplement (easily adapted to Pathfinder or even to previous editions and some retroclones). It’s admirably researched but still accessible. Better yet, it presents us a different take on Fantasy Africa, far from clichés like Tarzan and the “Dark Continent” of pulp tales – this alone made this product worthwhile for me. Nyambe’s second (and perhaps biggest) point is that it’s easy for Gamemaster to either it in their campaigns or just to steal those bits that interest them most. As a bonus, Nyambe easily stands as its own fantasy setting – there’s enough material here for years of campaign. When a combat starts, declare the First Round and ask each player to declare his intended action for that Round. You must also define, beforehand, the intended Action of each NPC involved, just don’t tell them to the players yet. Actually, if you group doesn’t mind it, I suggest that each one writes his Action on a small piece of paper. After everyone is ready, all intended Actions are revealed and the characters roll their dice simultaneously. Who hits/acts first is determined only AFTER the d20 is rolled. The Gamemaster uses the d20 to establish if the intended Action was successful and also how when it was accomplished. For example, suppose that you rolled a 15 for your Fighter’s attack on the d20. You’ll use the 15 for your attack roll, adding all the usual modifiers (BAB, Str bonus, any item bonus etc), but you’ll also use this 15 to determine your Initiative for that round. Usually, this means that your Fighter will add his Dexterity modifier to the rolled number (15). If he had Improved Initiative, he’d add his Dex modifier + 4. The idea is add some chaos to the usual static/tactic-heavy Pathfinder combat. 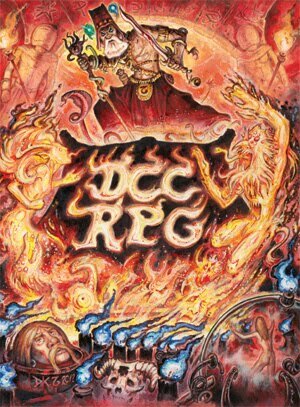 The concept isn’t new and was shameless stolen from the ORE (One Roll Engine) rules – a RPG system used in great games like Godlike and Wild Talents. Extra attacks – If you’re attacking more than once, then your first d20 also determines when all your secondary attacks take place in the Round. You still have to roll those attacks, following the normal rules. Actions that don’t require a roll – Sometimes your intended Action is simply to move, pick something etc. These actions don’t require a roll (usually). In situations like these roll a d20 just to determine when you act. I haven’t playtest this yet, but it may be an interesting alternative for lethal/grimdark games. It also makes things harder for spellcasters, which may suit some Gamemasters.